Palmoscopy (dermatoglyphics): how and why used? Palmoscopy – method study of the skin and relief the palm of your hand. Used not only in medicine but also in forensic science. Another name of this study – dermatoglyphics. The skin on the palm has terrain, so it is called a raised bed. This name appeared due to the fact that the pattern is reminiscent of scallops. They fold into intricate patterns, individual to each person and changing throughout life. In some inborn diseases, chromosomal mutations dermatoglyphic signs are markers. The patterns on the palms always been given mystical significance. It was considered that it is possible to predict the fate and determine the characteristics of a particular individual. However, evidence for this is not presented so far. The interpretation of these aspects is not of a scientific nature and refers to the palm, which was recognized as pseudoscience. However, the research conducted in the field of dermatoglyphics has identified a number of relationships between patterns on the skin and certain diseases. Triradius (Delta) – the place where three parallel groups of lines. Finger of the Delta are designated by the letters a-d with the second finger to the little finger. Scalloping account shows how many of papillary lines goes from the center of the picture to triradius. Types of patterns – arch, curl or loop. Triradius index (Delta) is the total number of deltas on all fingers. All indicators have a value in palmscape! Interdigital Delta (triradius) – analog parameter measured on fingertips. 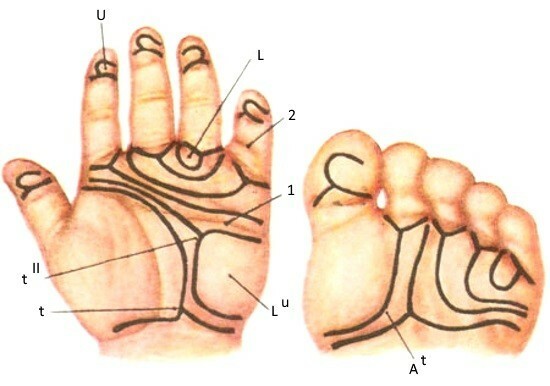 The Palmar lines. Investigate which area of the palm they end. Tenar and hypothenar – elevation of the thumb and little finger, respectively. 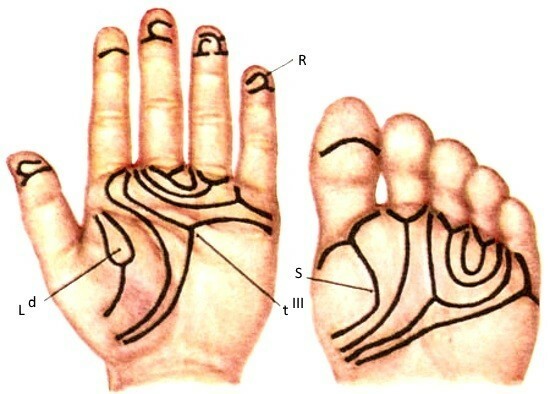 Palmar triradius, which is located near the midline of the palm. Denoted by the letter t. Line from deltas a and d to t, forms an angle atd, which is normally not more than 57 degrees. As mentioned above, palms may exhibit some genetic disorders. For example, if syndrome cat cry frequent patterns in the form of an arc and appear transverse crease of the palm. Consider the most common diseases that develop due to chromosomal mutations. These include down’s syndrome, Patau, Turner, Edwards, Rubinstein-Taybi, Nageli-Franceschetti-Jadassohn. Chromosomal mutations can be of different nature: neraskhozhdenie of chromosomes during division, anomalies in the number (increase or decrease in the number of chromosomes), the changes directly in the chromosome. Deconstructing palmoscopy, it is important to understand how genetic diseases are reflected in the characteristics of the pattern. A chromosome is a structure located in the cell nucleus. Chromosome consists of two long, connected, twisted among themselves, strands of DNA. And DNA, as we know, the basis of the body. With DNA, the synthesis of all proteins of an organism, which will then be or anatomical structures, or will be involved in various metabolic processes. Down syndrome is associated with trisomy 21 pairs of chromosomes. Features of palmscape patients with down syndrome lies in the fact that the two transverse grooves on the palm of your hand merge into one, formed one transverse fold, also increased the angle between triradius. Often, a similar furrow is found, relatives of patients, which may indicate genomanalyse. The angle atd in this case more than 80. Patients with patau syndrome observed increased atd angle, it is greater than 100, because the axial Palmar distal triradius is located closer to the fingers. Occurs transverse crease of the palm more than half of cases. From malformations of the hands is most often found polydactyly (increased number of fingers). This disease develops as a result of trisomy 13 pairs. The phenotypic syndrome is a severe fetal abnormalities, often incompatible with life. The mortality in this disease is extremely high. Syndromes developing as a result of chromosomal mutations, reflected in all organs and systems of the body, including, and on the palms. Above it was described that the patterns on the palms of the hands and feet in a specific way can change in different disease. The question remains about the practical application of this knowledge. Dermatoglyphics is considered an integral procedure in the framework of the examination by a doctor at suspicion on pathology-related genes. Contraindications this procedure has virtually no. It requires neither special training, nor any painful manipulations. The only option when holding palmscape impossible – injury to the palm, erasing a pattern (eg, severe burns). But in this case, to look around, maybe only one arm, not both. If palmscape the doctor performs a visual inspection of the palm of your hand, analyzing the lines of the arms and their relationship. Perhaps the photographs will be taken for further more detailed analysis of patterns or gluing them to a medical card. There are only two unpleasant moment, which can be expected of the patient. The first doctor with a marker or pen on the palm of your hand will note a separate line. The second – on the palm of your hand will be marked with special ink in order to leave the imprint of his hands on the paper. In any case, all that has been inflicted on the hands can be easily washed off with warm water and soap. Another incomparable advantage of the use of dermatoglyphics – the price. Studies of the patterns are held in the framework of the General medical examination, not implying any individual visits a special doctor. Thus, the inspection is likely to already be accounted for in the price of doctor visits. And if the inspection is carried out in state hospitals free of charge. Another advantage is time. Usually results can be obtained, that is, here and now. Changes in the pattern of the patterns of the palms and fingers are visible immediately. Availability of palmscape makes this study quite popular. However, besides the advantages of this method, like any other, has its disadvantages. The biggest and perhaps the main – validity. Let change the pattern visible to the naked eye, to rely only on these changes in the diagnosis of disease is not necessary. Using the palmoscopy, we judge the genotype on the phenotype. As mentioned above, DNA is the synthesis of proteins, which are anatomical structures. 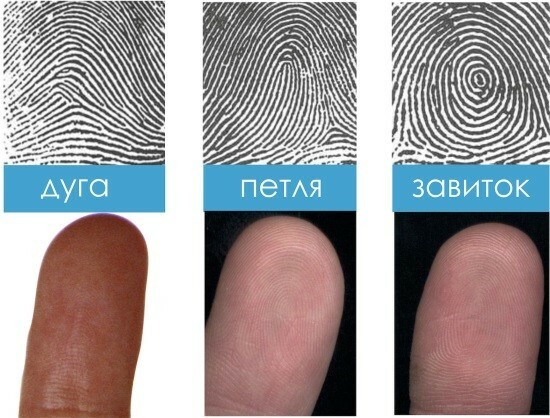 In our case, the patterns on the palms and fingers (the phenotypic manifestation of the genotype). To judge the genes thus it is possible, but not with 100% probability. Dermatoglyphics best acts in the framework of the heuristic approach. After analyzing the pattern will not need to undertake genetic analysis of all known disease, but only in a limited range, which will significantly save time and money, and nerves. Another disadvantage of palmscape – it can be used only in the postnatal period, i.e. after birth. But for prenatal diagnosis there are other research methods, such as ultrasound. In conclusion, I must say that dermatoglyphics are still spread not as wide as I could. Its capabilities are quite large, which allows the use of this study in various fields of life and science.